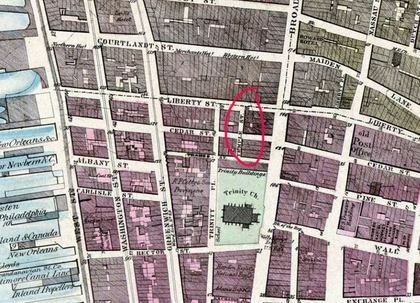 While passing through the Financial District seeking out locations to feature on Forgotten NY over the past 15 years, I'd always noticed a green and white street sign saying “Temple Street” attached to a lamppost on Liberty Street between Broadway and Trinity Place/Church Street. 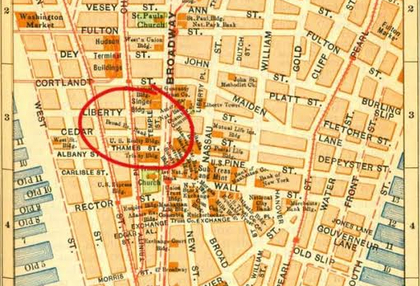 I duly listed it on my downtown Manhattan alleys list as a lost street that the Department of Transportation marks anyway, but never thought about it much. The green and white sign had come down in the aftermath of the 9/11 attacks, which occurred across Church Street. Evidenced by this map of what became the Financial District in 1695, Temple Street has been called this for quite a long time. 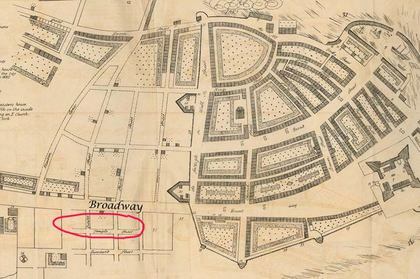 On the map, you can see it in the same space it occupied for the next three centuries, just below the large “Broadway” identifier I placed there. I had thought that “Temple” referred to Trinity Church, but the first Trinity was chartered in 1696 and the original building constructed in 1698. Note that Temple street runs for two blocks. On the map, Fort Amsterdam can be seen in the lower right. The U.S. Customs House, now Museum of the American Indian (1900), occupies this site. 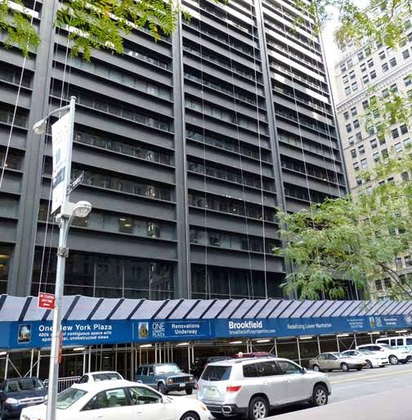 The fortifications on the north side of Wall Street also show up clearly. For many years a highlight of the park was J. Seward Johnson Jr.’s “Double Check” sculpture showing a Wall Street businessman. 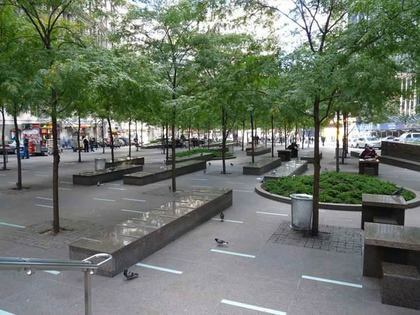 After it was damaged on 9/11, it was later rehabbed and replaced in Zuccotti Park. Mark di Suvero’s “Joie De Vivre” tripod sculpture was installed on the southeast corner of the park in 2006. 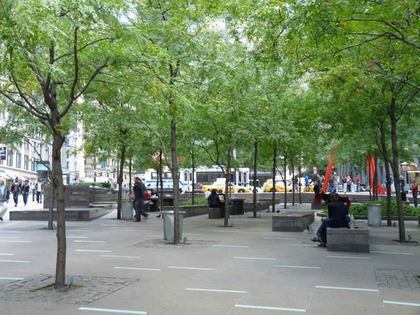 As part of the 2006 renovations the park was renamed for John Zuccotti (1937-2015) NYC Deputy Mayor in 1975 under Abraham Beame, the chairman of the Real Estate Board of New York, and of Brookfield Properties, which owns the park. Today, a street sign is all that remains of Temple Street, which has an over 300-year legacy.